Ferguson Pastor: This Is Not A Race Issue; This Is A Human Issue The Rev. Willis Johnson's church is in the Missouri town where 18-year-old Michael Brown was killed by a police officer. His recent interaction with an angry teen protester was emotional for him. The Rev. Willis Johnson (right) confronts Joshua Wilson, 18, as protesters block traffic during a demonstration against the death of 18-year-old Michael Brown in Ferguson, Mo., on Wednesday. Rev. Johnson convinced Wilson, one of the last holdouts in the intersection, that he should leave and avoid arrest. It's been a tense week in Ferguson, Mo. Protests erupted after the fatal shooting of 18-year-old Michael Brown by a police officer Saturday. For many, the fear and frustration is familiar. Amid the demonstrations Wednesday, the Rev. Willis Johnson tried to talk down 18-year-old Joshua Wilson. A photo in the Washington Post showed the two in a powerful moment. Johnson says police were ordering protesters to move aside as police advanced, and that he was trying to keep Wilson out of harm's way. He says he was not attempting to discourage protest. "If anything it was to affirm him — and to affirm both of us — because in that moment, we were being disaffirmed," Johnson tells NPR's Melissa Block. "We were being told ... that what we were doing was wrong, and it was not wrong." 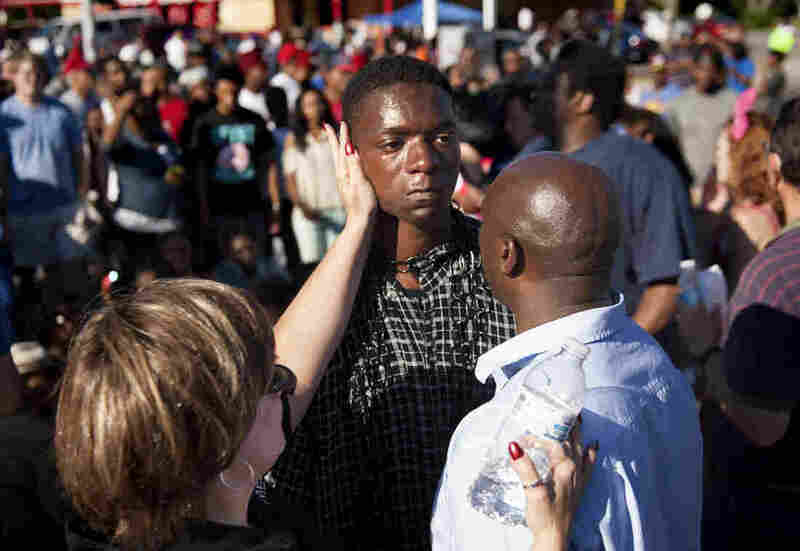 Johnson, the father of a teenager and pastor of Wellspring Church in Ferguson, had never met Joshua Wilson personally. But, he says, "I've met 'Joshuas.' " In fact, he says, he's been Joshua. I just embraced him. Because he was so angry, and you could feel it in his body, you could feel it in his speech. ... Something just said, "Grab him. Hold him." Maybe initially to keep him back, but ultimately to become what really is symbolic of the situation ... at hand. If you're going to fuss and cuss and be mad, I want you to do it with me. Do it in my ear. And at the same time, I just begin to pray with him and to say, "Give him the strength — give us the strength — to be courageous enough not to do what they expect us to do." And if you're honest and you're true, you can't help but look at other people and look at situations and say, "But by the grace of God go you — and me." That's what I saw. ... I've met too many men in the last four days, five days, of every age. And no matter how old we are, we all remember and know that that is us, in some shape, form or fashion. Because when I get pulled over, even with my credentialed and degreed ... self, I revert back to that 18-year-old and the things that my father told me about what to do when the police stop you. I am not alone. It's that way for all of us, because that is the human nature that we live. That is us. If it's not touching you, if it's not personal, that's where there's a problem. It's an intergenerational thing: to know that my father fears for me at 39 the same way he feared for me at 18 today. He texts me every morning and says, "I'm praying for you. Do what you've got to do, but be careful." He shouldn't have to say that, and I shouldn't have to say that and feel that way for my son or my daughter — or anyone's son or daughter. We want the cycle to stop.